This amazing film is about relationship loss, and what lengths we'll go to erase past emotional trauma. On a Valentine Day, Joel feels the impulse of going to the shore instead of working. He meets Clementine there and they have a crush on each other. Joel and Clementine do not have any idea that they loved each other in the past. Joel has just undergone a psychiatrist's experimental procedure of erasing Clementine from his memories when he found that Clementine did the same, just after their relationship ended. He was too frustrated by the idea of still being in love with a woman who doesn't remember their time together. During the course of the movie, Joel learned that love was something that could be simply forgotten no matter how much the pain hurt him. The only way to make the pain go away was to continue living his life without Clementine by his side. Along this erasing process, Joel realizes he still loves Clementine and he doesn’t want to lose her, fighting for keeping the memories of their moments together instead. 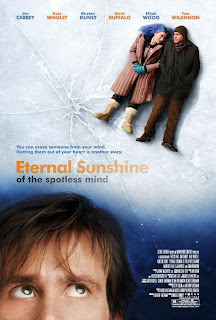 Buy a DVD "Eternal Sunshine of the Spotless Mind" from Amazon!